For courses in Human Resource Management. 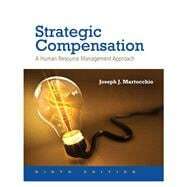 Strategic Compensation: A Human Resource Management Approach demonstrates the art and science of compensation practice and its role in a company’s competitive advantage. Through focused activities and supporting course material, readers build a solid foundation to become proficient compensation professionals. The Ninth Edition focuses on the context of compensation practice, the criteria used to compensate employees, compensation system design issues, employee benefits, the challenges of compensating key strategic employee groups, and pay and benefits around the world, preparing readers to assume the roles of successful compensation professionals. This title is available with MyManagementLab—an online homework, tutorial, and assessment program designed to work with this text to engage students and improve results. Within its structured environment, students practice what they learn, test their understanding, and pursue a personalized study plan that helps them better absorb course material and understand difficult concepts.